There are more postings on our dedicated Yamaha Thundercat board than for any other bike in our Talk Bikes section. Owners of the Yamaha sports all-rounder have notched up 2161 postings. 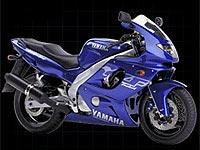 They are closely followed by the owners of 2000/2001 Kawasaki ZX-6R owners with 2104 postings. Owners of Honda’s VFR800 had clocked up 1867 postings by Wednesday morning, discussing everything from faults and fixes, to the best tyres to use. Users also use the boards to organise ride-outs and other gatherings. If you haven’t joined in yet, it’s about time you did. Want to add your voice? Follow the Talk Bikes link in the top navigation bar. You can also access the boards by browsing for the individual bike you are interested in in our BIKES section (see top navigation bar). You can read the threads as a visitor, but to add your postings you need to be registered. That’s free and easy to achieve. Simply click LOG IN at the top, right of the page and fill in the online forms. There's a very good chance that if you're reading this you are over 30 and less than 40 years old.